The 7224 is capable of providing continuous DC at 13.5 volts and simultaneously producing high-frequency AC in excess of 200 kHz (+/-1 dB at 1 watt, 8-ohm load). Previously, Ford had recommended AE Techron's now-discontinued Techron 7560 amplifier for testing to the previous Ford Standard, EMC-CS-2009.1. While the Techron 7560 could provide a frequency response up to 100 kHz, the 7224 provides over twice the bandwidth available with the 7560. This improved performance will be valuable in today's environment of continually increasing RFI. In addition to its wider frequency range, the 7224 offers several advantages over its predecessor and other competing testing equipment. Weighing just 41 lbs (18.6 kg), the 7224 has half the weight of the 7560. Its slim, 3.5 inch (8.9 cm) height allows it to be rack-mounted using only 2U (standard EIA 19-inch rack units). The 7224 internal assemblies have been designed with minimal external wiring and connectors, providing increased endurance and reliability. Its robust, linear power supply results in extremely low noise, and its bi-level switch design limits heat dissipation to output devices. The 7224 operates from single-phase, 50-60Hz AC and is available in both 120 V and 220/240 V models. It has received CE certification and bears the CE Marking. This engineering specification addresses Electromagnetic Compatibility (EMC) requirements for electrical/electronic (E/E) components and subsystems for Ford Motor Company (FMC). This specification is the direct link from RQT-002700-000417 (Legacy Requirement ARL-09-0466). These requirements have been developed to assure compliance with present and anticipated regulation in addition to customer satisfaction regarding the EMC of vehicle E/E systems. This specification replaces EMC-CS-2009.1. Full document. 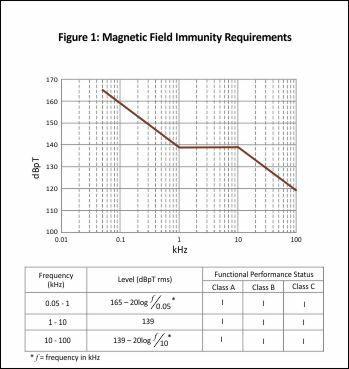 Magnetic field immunity testing requirements cover the frequency range from 50 Hz to 100 kHz. Section 12 (RI 140) of the Ford EMC-CS-2009 Standard requires that the component, including any attached magnetic sensors (if applicable) shall operate without deviation when exposed to the magnetic field levels described below (Figure 1). 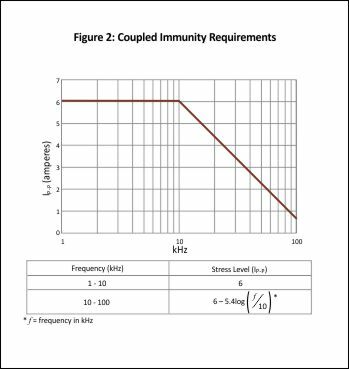 Coupled immunity testing requirements are related to component immunity from wire-to-wire coupling of unintended continuous disturbances.These distrubances originate from high-current PWM sources and the vehicle's charging and ignition system. 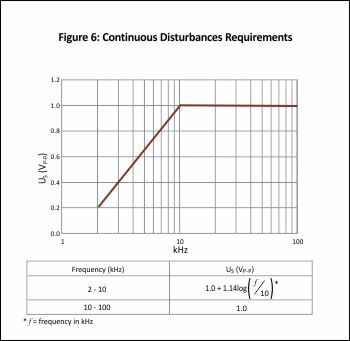 Section 14 (RI 150) of the Ford EMC-CS-2009 Standard requires that the device shall operate without deviation when exposed to sinusoidal electromagnetic disturbances as described below (Figure 2). 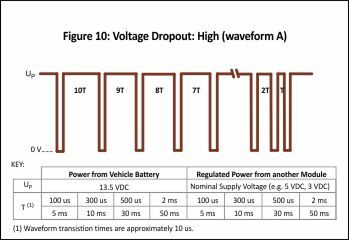 Immunity from continuous power line disturbances testing requires the use of a modulated power supply; Section 15 (CI 210) of the Ford EMC-CS-2009 Standard specifies that a DC-coupled audio amplifier with an output impedance of < 100 milliohms may be used. The Standard requires that the device shall be immune from continuous distrurbances that occur on the vehicle's low voltage (i.e. 13.5 VDC) electrical distribution system. The devices shall operate in accordance to the requirements described below (Figures 3 and 4). 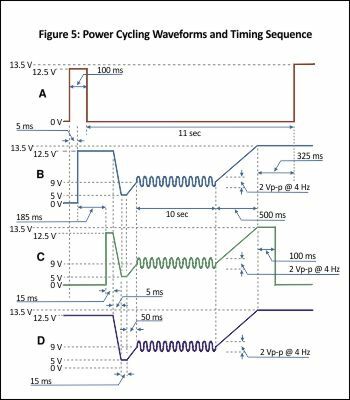 Immunity from power cycling testing requires use of a DC-coupled audio amplifier paired with an arbitrary waveform generator to produce one of four test waveforms (shown in Figure 5 below). 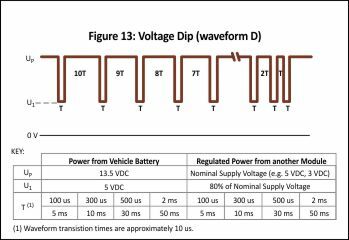 The specific application of these waveforms is dependent on the method used to connect the component's power supply and control circuits. Section 17 (CI 230) of the Ford EMC-CS-2009 Standard requires that the component shall be immune from voltage fluctuations that occur during initial start of the vehicle's engine under cold temperature conditions. 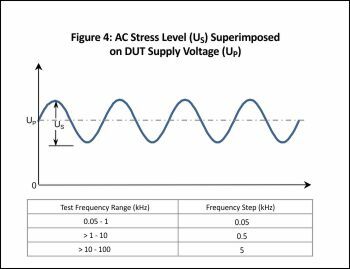 Immunity to ground voltage offset testing requirements specify that the components shall be immune from AC ground offset voltages, including both continuous and transient disturbances. 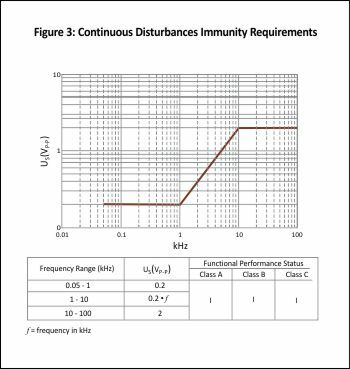 The Section 18 (CI 250) Ford EMC-CS-2009 Standard requirements for continuous disturbances are described in Figure 6 (below). 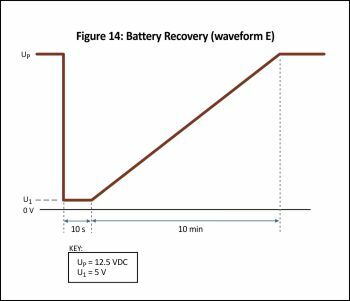 The requirements for transient disturbances are described in Figures 7 through 9. 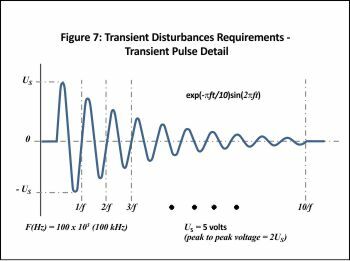 Transient disturbances consist of a damped sinusoidal pulse with a resonant frequency of 100 kHz. The pulse is applied using the delay sequence shown in Figure 9. 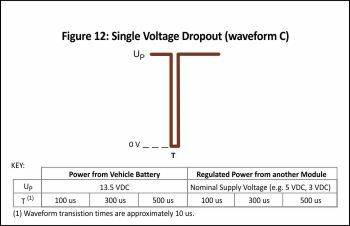 Immunity to voltage dropout testing requirements specify that the components shall be immune from momentary voltage dropouts, which may occur over the life of the vehicle. The purpose of this test is the verification of controlled recovery of hardware and software from power interruptions. 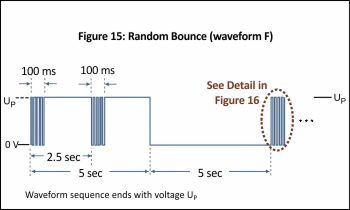 Section 19 (CI 260) of the Ford EMC-CS-2009 Standard defines six waveforms (Figures 10 through 16 below) that describe the requirements for this testing. "Just wanted to send a good word about our use of the 7224 amp that we recently purchased from you. 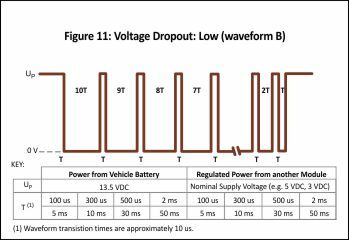 We’ve used it to amplify some specific transient, startup and shutdown waveforms provided by an arbitrary waveform generator for testing of 28 VDC input power military supplies. 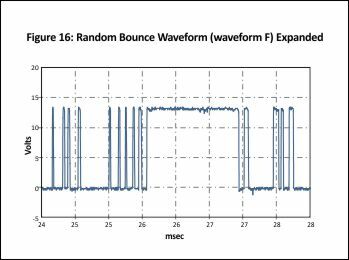 It supplied 33 VDC @ 9A steady-state for the power supply while superimposing 10ms transients up to 42.5V and 10µs transients down to 0V, all of which it did very well. "Without such an amp we would have likely had to design a specialized piece of test gear to perform the tests, and that would have generated a significant hit to our budget and schedule. The 7224’s combination of DC -300 kHz response while delivering over 20A of current at 28V is impressive." Copyright AE Techron, Inc. 2010-2016 - Formerly Techron - MRI Mouse image courtesy of Aspect MRI - Report site problems to the webmaster.